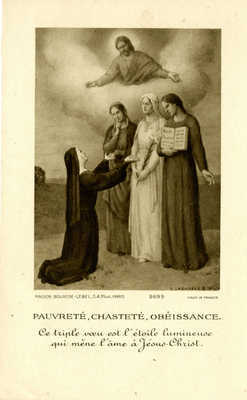 "Pauvreté, Chasteté, Obéissance holy card"
Catholic holy card illustrating the vows of consecrated life from the Auguste Martin collection. The front of the card depicts a nun kneeling before three women, representing Poverty, Chastity, and Obedience. Jesus is seen looking down from the heavens. The back of the card bears an inscription celebrating the diamond jubilee of a Sister Marie-Clémence in 1938. Pauvreté, Chasteté, Obéissance. Ce triple voeu est l'étoile lumineuse qui méne l'âme à Jésus Christ.